Upgrade your reverse lockout lever with a the PERRIN smooth glide reverse lockout lever. The PERRIN Performance reverse lock out lever combines the OEM reverse lockout ring, and plastic boot holder into one part making for a clean, simpler look for your shifter. 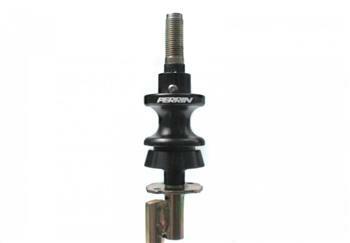 The PERRIN lockout ring’s finish matches the PERRIN Performance shift knob base making it look like one assembly. The PERRIN reverse lock out ring uses a small bolt to secure the cable. No longer will you have to deal with the factory spring pin to disconnect the shifter cable from the car making future removals much easier. Installation time is roughly 2 hours for the DIY’er. Any professional shop should be able to complete the install in about 1 hour. Take a look at the instructions to see for yourself.